Chris and I watched the State funeral for President Bush yesterday. We watched the television coverage for the hours that it was on beginning with the Capitol departure, where we paid our respects, through to where the family departed on Special Airlift Mission 41 from Andrews Joint Base. I was reminded of the history of the man. From a young Naval aviator during the Second World War, to Congress, to The CIA, Reagan's Vice President and then the 41st President of the United States. I listened to the speakers who told about his life and our times. Their words were recounted a life of joy and sorrows about a man who was genuine. The most decent and honorable person I ever met was my friend, George Bush. He never lost his sense of humor. Humor is the universal solvent against the abrasive elements of life. That's what humor is. He never hated anyone. He knew what his mother and my mother always knew: hatred corrodes the container it's carried in. George Herbert Walker Bush was America's last great soldier-statesman, a 20th century founding father. He governed with virtues that most closely resemble those of Washington and of Adams, of TR and of FDR, of Truman and of Eisenhower, of men who believed in causes larger than themselves. Six-foot-two, handsome, dominant in person, President Bush spoke with those big strong hands, making fists to underscore points. But, most importantly, I learned that the 41st President was a committed father, grandfather, and great-grandfather. He was a friend. He had honor and integrity. He was humble. Well, Dad—we’re going remember you for exactly that and so much more. And we’re going to miss you. Your decency, sincerity, and kind soul will stay with us forever. So, through our tears, let us see the blessings of knowing and loving you—a great and noble man, and the best father a son or daughter could have. The character of a man defines him. 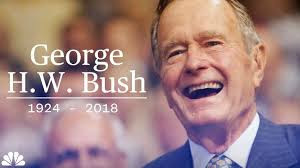 But through all of the words and tears what really moved me was that George H.W. Bush was a family man. He put his family first--and what a family he and Barbara developed. It was a great tribute to a father, who just happened to be President. I hope that when I dross the threshold to change my permanent residence that I will be remembered for the family that Chris and I have and not what I have done, but how I have accomplished the things in my life.